The Billionty-Oneth Geek: Jesus washes feet... really, he does that! Jesus washes feet... really, he does that! I was reading John 13 last week in an attempt to catch up with my devotionals and its funny how sometimes you want to do one thing, but you discover something else. At the time of reading, verse 21 stuck out to me where it says that Jesus was troubled in spirit. After reading the whole thing, I took a shower and was just reflecting on the passage that I had just read. Even though my mind was focused on that one line (and how unfathomable is it, just the thought of God being troubled), my head started thinking more about earlier in the scripture, specifically the story of how Jesus washed the feet of his disciples. Whenever I read this scripture, the take home for me is always on servant leadership. 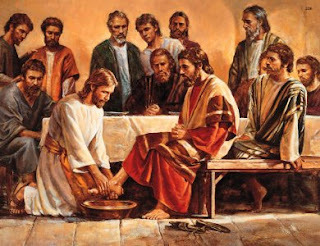 You have Jesus our Lord, bringing Himself down to our level to perform one of the most menial acts: washing someone else's feet. He said to His disciples that if He being our Lord could bring Himself to do this, that we should learn from His example, and do this for each other. So He does all this and also reminds them that no servant is greater than his master. To recap, not only did he perform such a humbling service, but He did it in the most humbling manner possible... bare-freaking-naked. He stripped down all of His clothes and only wrapped a towel around His waist. He used a towel specifically because He needed something to dry off the feet of His disciples, so it's quite possible that He wasn't even concerned about covering His junk. Anyhow, that was a digression, moving on. I finished showering and decided to dig a little deeper just to find out more about this scripture. It's interesting to note that of all the body parts Jesus could have washed, only the feet were of His concern. Jesus did this to purify us, cleanse our soul, before the presence of God. The feet are significant because it's the washing away of all the "dirt and crap" that gathers while we walk through this world of sin. Peter requested that if He was going to wash him, that He should also wash his hands and head. But Jesus knew it wasn't necessary because it was already accomplished. If we are truly His, then we are born again and our bodies are cleansed by the Word; it doesn't need to be done over and over (just as we aren't baptized more than once). But our feet always need washing as they get dirty every day when we sin. At the time, before the priests officially began their service in the tabernacles, they were fully washed at their ordinations. Their bodies would be fully bathed, then their hands and feet. The washing was never repeated because they were spiritually renewed by the Word and it was not necessary to repeat it. Whenever the priests engaged in any activity that drew them closer to God, they would prepare themselves by washing their hands and feet, but never their whole body. Much like the priests, we as followers of Christ need to wash our feet continually, and like them, we don't need to be washed all over again. When we do so, we do it everyday to cleanse off the guilt that builds and to wash off everything that makes us unclean. So the next time you go to God, make sure you show Him how dirty your feet are.